When it comes to cost of living, Roanoke offers the best value of any metro in Virginia. The Cost of Living Index measures regional differences in the cost of consumer goods and services. The composite index is based on six component categories – housing, utilities, grocery items, transportation, health care, and miscellaneous goods and services. This is where the overall ranking comes from. But how do we know what things cost? Roanoke Regional Partnership staff members collect this data each quarter and submit it to the council so that you can see how our region fits into the larger picture. It is based on more than 90,000 prices covering 60 different items for which prices are collected quarterly by chambers of commerce, economic development organizations, and universities in each participating urban area. Cost of living information is an important tool for individuals and businesses. It provides a baseline comparison for how far a dollar will go. And in the Roanoke Region your dollar stretches further. 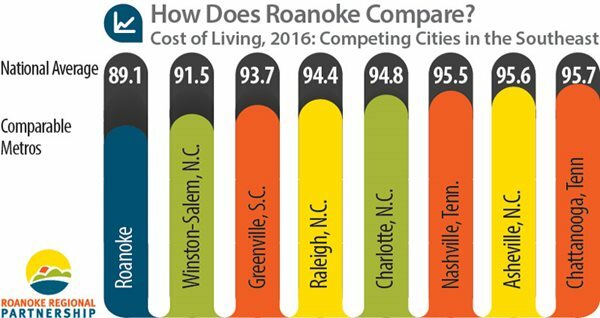 The numbers put Roanoke well below the national average for costs and ahead of similarly sized metro markets in the South such as Richmond (94.3), Asheville (95.6), and Chattanooga (95.7). New York City (Manhattan) ranked highest in cost of living with an index more than twice the national average (227.8), followed by San Jose, Calif. (222.9). Compare costs for yourself with this cost of living analyzer.